Deposit £10 and get a £10 bonus on selected games. 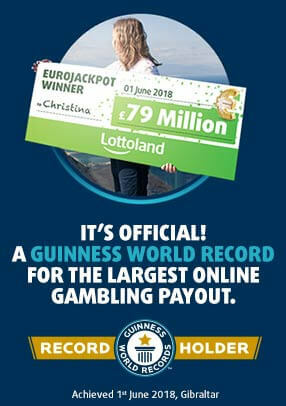 In order to qualify for a reward, you must be logged into your Lottoland player account and click on ‘Deposit Here' during the qualifying period(s). You must then deposit a minimum of £10 to ensure the bonus is applied to your account. The bonus will be credited to your account within a minute of making the deposit. The bonus must be wagered 30x times before becoming withdrawable cash. I.E. You need to wager £300 before any winnings from your bonus becomes withdrawable cash. Bonus funds may be wagered on the following games; Starburst, Vikings go Berzerk, Wolf Gold, Treasure Mine, Finn and the Swirly Spin, Fruit Blast, Bingo jackpot and Cashbusters Towers. Stakes on other games will not contribute to the wagering requirement. Only one reward from this promotion will be offered per player, per qualifying period.